This is typical of the blue palette favoured by Zhou in his middle years, and particularly from 1887 to 1890 (as noted under Sale 5, lot 75). Although the boat, the rooftop, and the tree trunks in the landscape scene are painted in a pale sepia colour, everything else, trees, grass, and distant mountains, is in blue or shades of black ink. On the other side, the blue palette is continued with the first appearance of a subject that is one of Zhou’s more unusual ones, not so often repeated as many of his others: chicks. 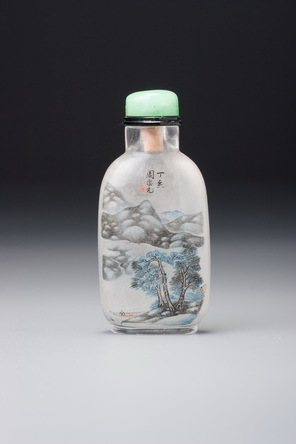 The painting is still in excellent condition, so we can read it as originally intended, including the white blossoms on the prunus branches, but in this case we know it is not because the bottle has barely been used. In photographs taken by Hugh Moss in 1971, the bottle is obviously caked with snuff. It has since been meticulously cleaned to reveal the painting in its original splendour. Mercifully, it has also been cleaned by someone who knew what they were doing, since there is no damage to the painting. 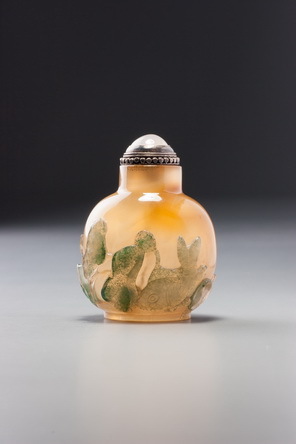 Cleaning the snuff or stains out of inside-painted snuff bottles is a risky business and not best undertaken by the inexperienced or faint-hearted. As a rule, there are two kinds of snuff discolouration that affect the appearance of the bottle. The first is dry, loose snuff that just adheres in places to the inside surface. This is very easily dealt with by the cautious use of one of those small wooden or plastic sticks with a ball of cotton attached to one or both ends. To reach the more difficult areas inside the shoulders, just bend the end of the stick sharply (if a wooden stick, some Scotch tape around the area you are bending is a good precaution to prevent it snapping off and remaining in the bottle). Caked snuff that has at some time become moist and hardened on the surface, and the stains left by this process, are more difficult to deal with. Some will come off with the judicious application of a dry cotton stick, which does no harm to the painting as long as the stick itself is not allowed to come into contact with the paint. What remains must be dealt with by very slightly dampening the stick. If it is too wet, the risk is run of simply removing the watercolours along with the stain, although they are held to some extent by the roughening of the interior surface. If very slightly damp, it can often remove the snuff without damaging the painting. This is where the faint-hearted should excuse themselves and take up another hobby, since any dampness has its dangers with watercolour paintings. The best way to do it is to breathe on the cotton so as to give it just a tiny bit of moisture from the breath. Then it can be tried very gently on a single patch of stain or snuff where there is no picture. This can then be gradually extended to painted areas, but with great caution and moistening the cotton only a little each time. One can never wet the cotton beyond the gentle moistening of a breath without running the risk of seriously endangering the painting. To wash out the inside with water, of course, is to risk completely destroying the painting, although bottles have, on occasions, miraculously survived the process reasonably intact. For another version of the rare chicks-and-prunus-branches subject, see Sale 3, lot 42, where Zhou comes as close as he ever does to repeating a composition. But although they are similar, there are sufficient differences to be certain that Zhou was not copying from a pattern book, as the Ye family did later, but painting from his heart in each case. The chicks have quite different personalities and detailing, and the branches, although placed in the same top left-hand corner, are quite different, even apart from the obvious fact that one has white blossoms and one orange.